Rabbi Noam Stein, our Upper School Director of Student Life and the chair of our Torah She Ba'al Peh and Machshava departments, will be sharing some of the unique work he has been doing in our high schools with a national audience. 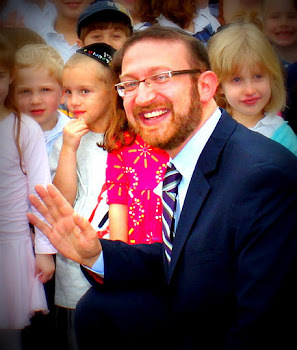 Though he has been teaching Jewish thought, or machshava, for many years now, Rabbi Stein led the way in creating and implementing a new curricula for our high schools that not only looks at classical questions and sources in Jewish thought, but also digs deeply into current pressing issues facing the contemporary Jewish community. In a few weeks, Yeshiva University's YUHSChinuch Community of Practice will be running a Jewish Philosophy Yom Iyyun for Orthodox educators hosted by the Ramaz High School in Manhattan. Rabbi Stein is one of only five high school educators nationally who, in addition to YU Rosh Yeshiva, Rabbi Mayer Twersky and YU Professor of Philosophy, Dr. David Shatz, will be giving a session at the conference. His talk, which draws on the new curriculum he has developed for our students, is entitled "Addressing Ethically Challenging Topics such as Am HaNivchar in a Liberal Age."